A message from Scott Gerard, founder and president of TechnoKids Inc. This month marks the 25th anniversary of TechnoKids. It is a great accomplishment. I wanted to take this opportunity to thank our TechnoKids Associates. Your dedication to the TechnoKids family has made this milestone possible. Many of our Associates have been with us from the beginning. Thank you Alex Hatzopoulos, from TechnoKids Greece, in sharing our vision. You are our oldest Associate and we appreciate that you believed in us right from the start. Other Associates are also achieving milestones this year. Celebrating their 20th anniversary is Sandra Maldonado, from TechnoKids Guatemala; José Benacerraf Walg, from TechnoKids Latinoamérica; and Albert Tan, from TechnoKids Malaysia. We are proud of your accomplishments throughout the years. We can’t wait to see what you do next! Many of you have been working with TechnoKids for more than a decade. Thank you Vasu Gounden, from TechnoKids Africa; Hayam Salah, from TechnoKids Saudi Arabia; Shelley Bearse from TechnoKids Japan; Randa Taysir Al Bustami from TechnoKids Jordan; Surekha Kembhavi from United Arab Emirates; and Barry Go from TechnoKids Philippines. We would not be able to fulfill our company mission without your continuous support. In recent years, we have welcomed new Associates. Omar Hussein from TechnoKids Lebanon and Cosmin Vranceanu from TechnoKids Romania, we are pleased you are part of the TechnoKids family. Together we are making a difference! Since 1993, our mission has been to combine education and technology in order to provide children with the skills that will best prepare them for the future. Today, more than ever, it is essential that students develop the technology skills they will need to thrive in higher education and the workplace. Our job is not done. Please extend thanks from everyone at TechnoKids Inc. to your staff members. Their hard work means everything! It is an exciting time to be working alongside schools and teachers. We look forward to the future. Learn more about TechnoKids Associates in your area. Visit the International TechnoKids Associates page. 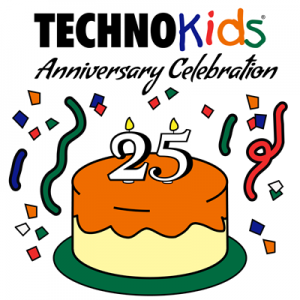 Today marks the 25th anniversary of TechnoKids Inc. We are so lucky to have the most amazing customers and Associates. Thanks for using our instructional materials with your students. We love making them! Happy TechnoKids 25th Anniversary! Throughout the years, TechnoKids has published hundreds of technology projects. We have written activities to help students create digital art, storybooks, slideshows, surveys, quizzes, timelines, budgets, biographies, web pages, posters, and more! Since 1993, when the company was founded, project based learning has been the cornerstone of product development. Instead of teaching technology skills in isolation, each technology project integrates the use of desktop and web-based apps into learning experiences. For example, TechnoResearch blends research skills, report writing, and word processing skills to produce a fact card. TechnoDebate combines collaboration, critical thinking, and presentation skills to debate a controversial issue. While TechnoInvestor, teaches financial literacy and spreadsheet skills as part of a stock market simulation. The interdisciplinary approach engages learners. At TechnoKids we want learning to be FUN. Every technology project has to be one that we would want to teach, and it MUST be something we would want to do if we were a kid. Whether it is a graphic story in TechnoToon or an interactive map in TechnoMap the activity must be an interesting way to learn. Plus, the product should look really impressive when it is finished. Throughout the years, the focus has been on systematically teaching essential technology skills to prepare students for the future. Although any project can be taught in isolation, the product line is designed to scale in difficulty from Grades 1-9+. This allows schools to adopt a technology program that gradually develops word processing, presentation, spreadsheet, Internet, digital citizenship, desktop publishing, database, photo editing, animation, and programming skills. Each technology project, builds on the previous one. For example, to develop word processing skills TechnoKids offers a range of projects that increase in difficulty. TechnoStories introduces basic word processing skills to primary students using templates. TechnoJournal targets essential text and picture formatting techniques for elementary students. TechnoNewsletter teaches a thorough understanding of word processing to middle school students. While, TechnoAdvertise is an in-depth exploration of advanced techniques designed to prepare high school students for college and the workplace. Continually updating the product has fostered customer loyalty. In the beginning, TechnoKids published instructional resources for learning centers. When we began to create materials for schools, the activities were for Office 97 and Windows 98. At the time, the Internet was not readily available to most users. Over the years, the development team has kept pace with the ongoing change. Today, there are technology projects for Microsoft Office 2016, and the Office Online web-based apps. In addition, there are technology projects for Google Docs, which undergo constant updates to keep them current. As well, TechnoKids writes projects for Adobe including activities for the most current version of Photoshop and Animate. There is always something new and exciting happening in technology. Despite all the wonderful projects we have already published, there are still many more ideas left to create. We can’t wait to make technology projects for Sway and OneNote. As well, we talk constantly about 3D modelling and how that can be done simply. In addition, we have our sights set on more programming projects. It has been a fabulous 25 years. It is thrilling to look ahead to what comes next. We appreciate your ongoing support. Let the TechnoKids 25th anniversary celebration begin! 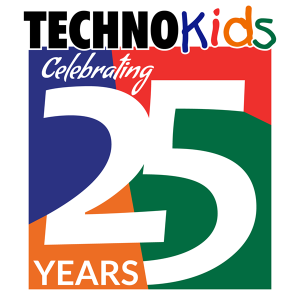 On January 23, 2013 TechnoKids Inc. celebrates its 20th anniversary. The company has seen a lot of change throughout the years. 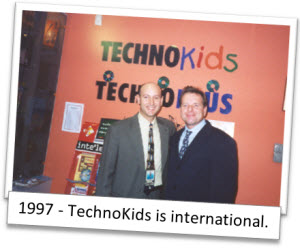 The door on the first TechnoKids learning center opened in Oakville, Ontario, Canada in 1993. Today, there are thousands of learning centers, schools, and organizations using TechnoKids Computer Curriculum. Twenty years ago, Windows 95, Office 97, and Google had not yet been invented. Throughout the years, the software and devices have changed. However, one thing has remained the same. Children need technology skills to be adequately prepared for the future. The commitment to this mission has never wavered. In 2013, it is more important than ever that children learn to become competent, responsible digital citizens. One of the reasons TechnoKids Inc. has been able to continually grow and prosper is because it has a dedicated group of Associates who believe in the company mission. Their loyal support and hard work have made it possible for children all over the world to learn essential technology skills using TechnoKids Computer Curriculum. Development of new TechnoKids technology projects continues. Underway are plans for a Windows 8/Office 2013 product line. As well, in the works are some web 2.0 technology projects. Throughout the year, TechnoKids will be running anniversary events to thank its customers. 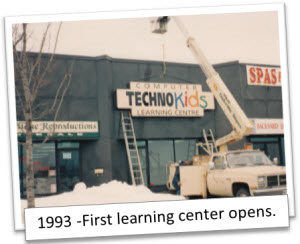 1993 TechnoKids opens first learning center in Oakville, Ontario. 1997 We’re international! Alex Hatzopoulos and George Papadakis bring TechnoKids to Greece. Christa Love and Laurie Gerard join the team. 1998 Here we grow again! TechnoKids arrives in Central America thanks to Fernando Maldonado in Guatemala and in South America thanks to Jose Benacerraf from Venezuela. Albert Tan brings TechnoKids to Malaysia and Mohan Tammana from NeoCity introduces TechnoKids to India. Form partnership with John Knox Christian School in Oakville, Ontario. 2001 Vasu Gounden brings TechnoKids to Africa. 2002 TechnoKids comes to the Middle East when the team expands to include Faten Salah in Saudi Arabia and Surekha Kembhavi from Knowledge Hub in United Arab Emirates. 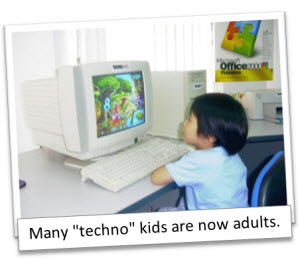 2003 Children in Japan become “techno” kids when Shelley Bearse becomes an Associate. Jordan is introduced to TechnoKids when Randa Taysir Al Bustami joins the team. 2004 Launch first e-commerce site. Hella Comat joins the curriculum development team. 2005 Sell first downloadable technology project. 2006 Welcome Philippines! Barry Go becomes an Associate. 2007 Release Office 2007 product line. 2008 Set up new head office in Burlington, Ontario. 2010 Release Office 2010 product line. 2013 We are not done yet! What’s next? Office 2013 product line, web 2.0 projects, and more!